Here we are again and we are already into February of 2019 Wow the last month went by so quick. This week our colour is called Pacific Point- What a lovely colour blue this is. I just love it. I thought I would revisit products from the Annual catalogue for my creation and I just love this card. I have made is few times now and you will also find my YOUTUBE video for this card (Different Colour) on my blog as well. I don't think the photo's do it justice is looks heaps better in person. I started with a Whisper White Card and added the mat's for the front and insert in the Pacific Point and I did all my stamping in the same colour. I used the DSP from the Garden Impressions set and I think it picks up the colour fantastic. 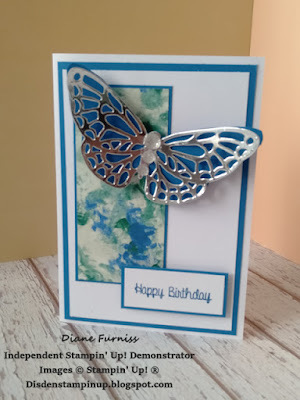 I cut my Butterfly from the Abstract Impressions Bundle in Silver Foil Sheet and then I traced around it onto some Pacific Point card and hand cut this to make a solid butterfly to place behind. 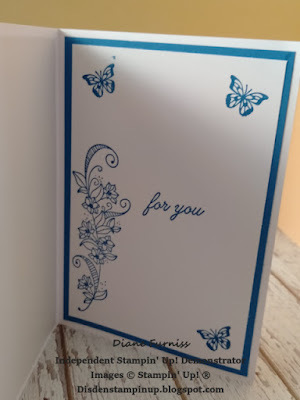 I then attached this and the sentiment to the front of the card using dimensionals and added some faceted gems to the body of the butterfly. The sentiment is from the Hand Delivered stamp set by the way. I stamped the inside of the card using the Beauty Abounds stamp set as I thought this was just such a pretty sprig and butterflies. If you would like to purchase any or all of the products used in this project please either Call, Email or PM me so that I can help you with your Purchase. 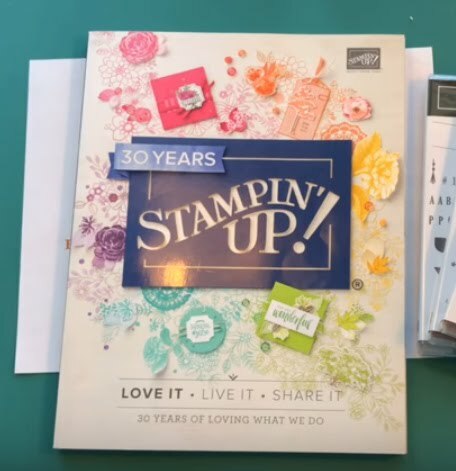 All product are current at the time of this Blog from the 2018-2019 Annual Catalogue and the 2019 Occasions Catalogue. 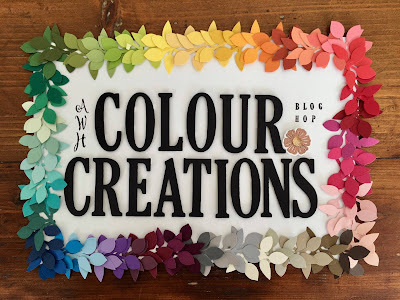 Don't forget if you purchase $90 of product before the 31st March 2019 you can choose a free item from the Sale-A-Brations Catalogue so don't wait to long. Gorgeous card and gorgeous colours Diane. Thank you for hopping along tonight! Your card is so pretty! 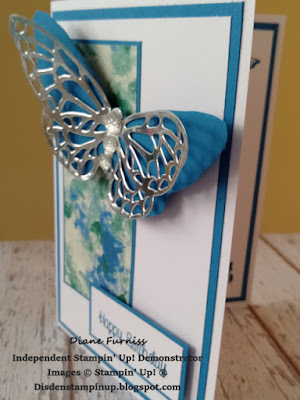 I love the layered butterfly, and the DSP is perfect for this card. Love the silver overlay on the butterfly Diane. Really adds a pop of elegance. A really lovely card Diane and the inside stamping is so pretty too. Beautiful Diane - love the colours accented on the DSP (I initially thought it was marbled technique on glossy cardstock).